Steve Jobs may have launched the iPhone 3G on Monday, and we may have gotten a hands on with it already, but in typical Apple fashion, there's still a lot of stuff left unsaid. How does activation work? How will first-gen iPhone users bring an iPhone 3G onto their plan? Does the GPS work for driving? How much will games cost on the App Store? We've got answers. Lots of them. How much will an iPhone 3G cost? $199 for the 8GB version, which comes only in black, and $299 for the 16GB version which comes in black and white. What's changed between the first generation and the iPhone 3G? Honestly? Not all that much. 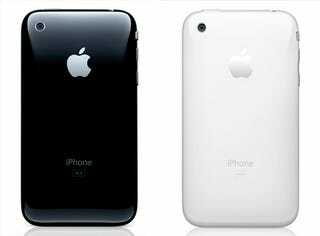 The iPhone 3G has all the features of the first one, plus faster 3G data downloads, GPS, and a better battery life. Externally, the phone's casing is slightly changed, with a thinner edge and thicker middle, but a flush headphone jack and solid-colored back make up the only other major differences visually. Everything else from the screen to the number of buttons and switches on the outside are the same. How much will it really cost me over 2 years?. That depends on how many minutes you use and how many text messages you want to sign up for, but at AT&T's lowest plan price of $39 a month for 450 minutes, plus a mandatory $30 data charge and $5 for 200 text messages, you're looking at $1975 over the course of two years. Before tax and other fees. Here's how it stacks up against the old iPhone and against other 3G smartphones on Verizon and Sprint. When can I buy it? If you're in one of the first countries to get the phone, which includes the US, Canada, the UK, Spain, Japan and Mexico, it's July 11. Otherwise, it's still unknown. Come July 11, there's going to be a gigantic line of people wanting that phone. You'll have to wait not only for people in front of you to buy a phone, but activate it too-which is now mandatory and takes about 10-15 minutes. If you can wait, we'd recommend going after July 11. Where can I buy it? In either an Apple store or an AT&T store. There won't be any online orders for this one. How fast is the 3G over 2G (EDGE)? During the WWDC keynote, Steve Jobs showed a demo that compared the iPhone 3G vs. the old iPhone when downloading a large web page with lots of images. Apple's site lists the result of that matchup as 20 seconds vs. 48 seconds, which is 2.4x faster. We've got a explainer about the details of 3G as well, if you're interested. How does the GPS work? We've got a great tutorial on how the iPhone's GPS works. Long story short, it's A-GPS, or assisted GPS, which means most of the time it uses the cell towers and Wi-Fi to help triangulate (but doesn't necessarily need help). If you're looking to use the iPhone 3G as a GPS in your car for navigation, there's a catch. There's a restriction in the SDK that prohibits developers from using the phone for "real time route guidance". You can still use Google Maps to help guide you if you're lost, but it's not as smooth a system as a real GPS. TomTom may have an iPhone 3G guidance suite already in the works, despite the SDK restrictions. Will the added 3G and GPS hurt my battery life? Apple's improved the battery life compared to the old version, which ups the talk time on 2G (same as the first iPhone) from 8 hours to 10 hours. On 3G, you get half that. So yes, your battery life will be significantly degraded when you're using 3G instead of 2G. Apple still hasn't provided numbers on how much GPS use will degrade your talk time. What about that rumor that the iPhone 3G has a front camera? Yeah, not so much. Apple didn't say anything about that during their keynote, and there's been no evidence of it yet. There's a weird anomaly on the demo iPhone that Apple's Phil Schiller was using on stage during the event, but it's probably just a weird fingerprint. What comes inside the iPhone 3G box? Not a whole lot. There's no dock, but there is a smaller charger that's great for children. Does the iPhone 3G finally have MMS/picture messaging? Unfortunately not. Not officially, anyway. There are third-party apps already available that give your iPhone a sort of MMS functionality, but it's not great. Can I tether the iPhone 3G to my laptop to get on-the-go internet? Not out of the box, no. The old iPhone was able to be hacked into doing this, but EDGE speeds meant that people only really used it in emergencies. With 3G, it'll be much more useful. We'll keep an eye on this one. How durable is it compared to the first-gen? Our hands-on will tell you more about that, but from what we heard, the new backing is a lot more fingerprint-smudgy than the first. When will the iPhone 2.0 software be released? At the very latest, July 11, when the iPhone 3G is launched. There are rumors that it can come as early as June 27, but Apple hasn't given any official word yet. Do I need an iPhone 3G to get Exchange and other businessy features? Actually, no. Apple's site makes no mention of needing iPhone 3G, and specifies that you only need iPhone 2.0 software. Since iPhone 2.0 is available on the old 2G iPhones, you should be in luck. What's MobileMe? It's Apple's replacement for .Mac, which manages your email, calendar, contacts, pictures and various other things. It's useful for iPhone users because it allows you to sync stuff automatically between your phone and your various computers. Any changes you make on one device gets pushed to the other ones. Apple MobileMe Official: Sync For the "Rest of Us"
Do I need an iPhone 3G to use MobileMe's syncing features? No, you can actually even use it on an iPod Touch, if you bought got one of those by accident. Do I need an iPhone 3G to use the iPhone 2.0 software? No, you're free to install the new software on your existing iPhone, taking advantage of pretty much all the software features-including the App Store-that are on the iPhone 3G. Are there limits to what kind of applications I can download in the App Store? Not really. A good 71% of iPhone applications will be free, with the rest starting at a price of $0.99 going all the way up to $999. You can pretty much download as many apps as you have space for on your phone. The largest applications will be 2GB, but we don't think there are going to be very many at that weight. The Sims for iPhone, maybe, if EA ever decides to release that. Is there going to be iChat? Apple unveiled the AIM application back at the last event, but as far as we know, there hasn't been any talk of iChat (like the one on OS X). As such, we wouldn't count on any iChat Video chat either. Who's making and supporting games? Unlike the iPod games, which were only made by a select few companies, pretty much anybody can make stuff for the iPhone. Look out for both major game developers and one-man coding shops to make games you want to play. Do I need to sign a new two-year contract with AT&T if I buy a new iPhone 3G? Yes, but the good news is that your old contract gets ripped up. If you signed yourself into AT&T's grasp back when the iPhone was launched, you'll only have to stick with them for another two years starting now, not three. It's as if you're an entirely new customer. Can I activate my iPhone over iTunes like I did the first time? Apple and AT&T want you to activate your phone in stores, but there's a possibility of activating it over iTunes if you somehow didn't do it in the store. However, you will be required to sign an agreement while you're in the store stating that you're going to enter into a 2-year contract eventually, and you'll be penalized if you don't sign up within 30 days. More details are here. Will my old iPhone plan work with the new iPhone? No. You'll have to sign up for 3G data, which is $30 (the old iPhone plan was $20). If you want those same 200 SMS messages that were bundled with the old plan, you'll have to pay an extra $5 a month. If you want unlimited messaging, it's $20 a month. Will activating a new iPhone 3G brick my old iPhone? Definitely not. You'll be able to give your 1st gen iPhone to someone to reactivate via iTunes on a new plan. Can I use the iPhone 3G on a prepaid plan? AT&T hasn't confirmed this yet, but we'll try and find out. Thanks KJA. Update: Reader PJ has pointed out that AT&T's policy is that no prepaid and pick your plan will be allowed with the iPhone 3G. What are European iPhone plans looking like? You'll have to check your local provider, but from what we've been hearing, O2 in the UK and Telefonica in Spain will get free a iPhone 3G if they sign up for an 18-month plan that's at least $88/month. What happens a year from now when Apple releases an even better iPhone? Nobody really knows, but it's likely that they'll just do what they did this time and have you buy the phone and renew the contract for another two years. Thanks Gregory. What's the price for the iPhone for existing AT&T customers who may or may not be eligible for an upgrade? AT&T's just told us that yes, ineligible customers will have to pay the full, unsubsidized price for the iPhone. See the post for more, but basically it won't be $199 and $299. No official price has been set yet. Will there be cases for the iPhone 3G when it launches? Yes. Belkin and Griffin, two of the bigger case manufacturers, have already made a whole bunch of cases like this one for people who really need to protect their phones. Those should be available come July 11. Can I get a free upgrade to the iPhone 3G? I just bought an old one! Yes, if you purchased it after May 27. Did some feature that I wanted get added to the iPhone 3G? If the feature you wanted wasn't 3G, GPS, or a flush headphone jack, the answer is probably no. No copy and paste, no video recording and no improved camera, among other things. Will I be able to use this thing on T-Mobile like I was before? Eventually? Probably. The iPhone hacking team says that they've got a pretty good grip on the 2.0 firmware, which means they can most likely jailbreak it soon after the iPhone 3G is released. With that done, it's only a matter of time that they'll be able to SIM unlock it to use on other networks. The only problem is getting past AT&T's mandatory in-store activation after you purchase a phone. If I somehow get hold of an iPhone 3G and shove in a SIM from my old iPhone, what happens? That's a pretty damn good question. We're not sure. If the iPhone 3G is straight out of the box, it'll need to be activated. If it somehow already got activated (or, hacktivated), you might be able to just use it on your old iPhone 2G plan. We'll keep an eye on this. Thanks Moe. Should I sell my old iPhone to raise money for the new one? Sure, if you don't know anybody who's worthy enough for you to give your old one to, you might as well sell it. Should I sell my old iPhone to raise money for the new one on Craigslist if I live in a lousy neighborhood? No. No you shouldn't. What's the return policy like? You've got 30 days to get that thing back to AT&T if you discover that your AT&T reception is super lousy at your house, or if you just don't like the thing. Does the iPhone 3G work like an iPod with iPod accessories? Yes, it works just like the first iPhone does. Most iPod accessories will support the iPhone 3G, but some speaker docks might have some GSM interference static if it isn't shielded correctly. Can I use the iPhone 3G on Verizon or Sprint? Nope, never. Not even if you unlock it. Can I still buy your book teaching me how to use it? Sure. Most of the basic functions such as calling, texting, iPodding and emailing are the same in the new iPhone 2.0 firmware as they are in the old one. You or the person you buy it for will still get a lot of use out of it. Plus, you can then lead off all your emails to me with the line "I bought your book, so..." in order to coerce me into responding faster. If we haven't answered your question, feel free to shoot me an email (it's on the left-hand column) with the subject "iPhone 3G FAQ" and I'll try and update this FAQ with the answer. Thanks! You can also access all our iPhone 3G coverage by clicking here as well. If I buy my friend's old iPhone when he updates to iPhone 3G, can I use it as a cheap iPod touch without activating it? Yup! Everything but the calling features should be active, except it will say "No SIM" at the top. Thanks Andy. In light of MobileMe apparently being an instant push service, will iPhone 3G also support push from other IMAP service providers? We haven't heard any word from Apple that there's any kind of push email besides to MobileMe and Exchange servers, not counting Yahoo, which is already push now. Thanks Andrew. Will you be able to buy insurance through AT&T like for other standard plan phones? AT&T's Asurion will cover all phones for $5 EXCEPT the iPhone, which is the way it's been since the first iPhone's launch. Thanks John. What are the chances of Apple releasing an iPhone with increased data storage before the next-next gen iPhones come out? Pretty damn likely. I'd expect a 32GB iPhone some time late this year or early next year. Thanks David. What will happen to the current Installer.app once the App Store launches? Will people keep updating this or will it be considered piracy? Apple doesn't exactly welcome the current Installer.app and jailbreaking efforts with open arms. However, since the App Store is going to be bringing in revenue to Apple, it's possible that through jailbreaking and Installer.app, you could bring pay-for-play apps for free onto your phone without actually paying for it. My wife currently has a [insert lousy phone] with AT&T. Will she be able to keep her phone number when she upgrades to the iPhone 3G? Yes. She'll be able to renew the contract for 2 years and still keep her phone number. Thanks John. SoftBank Mobile currently operates both PDC (Japanese 2G) and W-CDMA (UMTS 3G) networks. SoftBank's 3G network is compatible with UMTS and supports transparent global roaming for existing UMTS subscribers from other countries outside Japan. Subscribers of GSM networks having roaming agreements with SoftBank Mobile can also roam on the SoftBank 3G network by using UMTS handsets. Will MobileMe users have the ability to perform a remote wipe of their lost/stolen iPhone 3G? It's not one of the features listed on Apple's site for MobileMe, and it's more a business/Enterprise feature. It's unlikely, but we don't know for sure. Will you need the $45 AT&T Enterprise data plan in order to use Exchange or MobileMe? For MobileMe, no. That'll be available to everybody. We're checking on the Exchange part. Thanks Thomas. What will happen to my rollover minutes I accrued over the last year? AT&T's preliminary answer says that you'll keep your rollover minutes, but there's no official statement on this yet. Thanks Brian. I have 2 years of AppleCare through October of 2009. If something happens to my phone in the future and they want to replace it, will I get an iPhone 3G or the old one? That depends on Apple. If they've got any stock of the original one, they'll give you a refurbished unit. If they've only got iPhone 3Gs left, you might get lucky? Thanks Boyd. After I activate my iPhone 3G, will I be able to sync all the settings from my old iPhone onto it? Yes. When you activate the new phone, iTunes will ask you if you want to sync the old existing data onto it. Do a sync with your old phone before docking your new one and you'll be set. Thanks Andrew. Is there a difference between buying the iPhone at AT&T and buying it at Apple? Only if you're a business customer. AT&T says that there's no difference between regular customers, and both stores can do things like transferring your number from another carrier. See here for more details. What's the final pricing information for AT&T's plans? Here it is below. What time will the iPhone be on sale on July 11? 8am, so if you really, really want one, you might have to camp out. What new features are coming in iTunes 7.7, the update that's coming July 11 along with the iPhone 2.0 software and iPhone 3G? MobileMe stuff, parental controls for games, and various other features like using your iPhone and iPod Touch as an iTunes remote. Click here for video and screenshots. Wait, did you just say that iPhone will be able to control iTunes? Yup. You're getting a free remote control App. Is there a good reason why the enterprise data plan is more expensive than the standard one? A good reason? AT&T says it's because business customers use more data than consumers, so they charge more. Is there an upgrade fee for the iPhone 3G on AT&T? Yes. $18, says AT&T.